Gwyneth’s Gift Foundation fosters a Culture of Action through public awareness and training. The Awareness Program focuses on using social media, Foundation created material, free training at community events, advocacy, and public speaking engagements to promote the importance of Hands-Only CPR and the use of an AED. Additionally, we partner with civic groups, local EMS, grassroots organizations, and private business to bring awareness to a bystander’s ability to save a life. To spread awareness throughout a community, Gwyneth’s Gift Foundation also supports programs such as PulsePoint and HeartSafe Community. 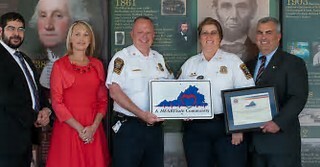 The heart-safe practices implemented by The Stafford County Fire and Rescue Department in addition to the passage of Gwyneth’s Law, among other efforts, contributed to Stafford County earning the first HeartSafe Community designation in the Commonwealth. In December 2017, Gwyneth’s Gift Foundation Chairman, Joel Griffin, spoke at the HeartSafe Community ceremony in Powhatan County – the fifth jurisdiction in Virginia to be designated a HeartSafe Community. ♥ Become CPR trained or certified and then encourage five friends to get trained. Training can be obtained through local chapters of The American Red Cross, American Heart Association and often through your local fire and EMS services. ♥ Find out if your local schools are in need of an AED then help them acquire funding. Money for the purchase of these devices may be obtained with the help of local businesses, grants from local hospitals, Gwyneth’s Gift Foundation or raised via fundraisers and /or the school’s PTA. The opportunities for acquiring a device or funding are numerous. ♥ Plan a CPR training day at your place of work or business. Look to see if an AED is available in your building. Learn how your community can earn a HeartSafe designation by visiting their website for more information. 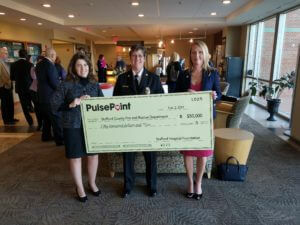 Gwyneth’s Gift Foundation worked with Stafford Hospital Foundation and Stafford County Fire and Rescue to make Stafford County the first location in the region to obtain PulsePoint. Learn how your community can participate in PulsePoint by visiting their website.